Home CDN , children , crafts , feature , holiday , holidays , homeschool , January , papercrafts , printables , US , worldwide January 6th - Sherlock Holmes Freebies! January 6th - Sherlock Holmes Freebies! -- A fictional private detective created by British author Sir Arthur Conan Doyle. 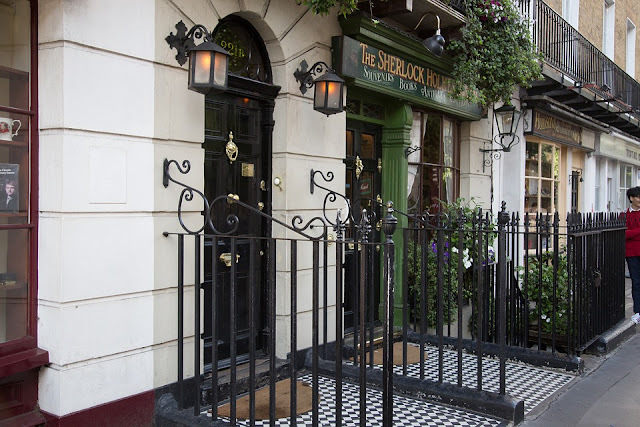 Referring to himself as a consulting detective in the stories, Holmes is known for his proficiency with observation, forensic science, and logical reasoning bordering on the fantastic, which he employs when investigating cases for a wide variety of clients, including Scotland Yard. -- Since his first appearance in Beeton's Christmas Annual in 1887, Sir Arthur Conan Doyle's Sherlock Holmes has been one of the most beloved fictional characters ever created. Now, in two paperback volumes, Bantam presents all fifty-six short stories and four novels featuring Conan Doyle’s classic hero -- a truly complete collection of Sherlock Holmes's adventures in crime! • The Sherlock Holmes Book: Big Ideas Simply Explained -- Packed with witty illustrations, clear graphics, and memorable quotes making it the perfect Sherlock Holmes guide, covering every case of the world's greatest detective, from A Study in Scarlet to The Adventure of Shoscombe Old Place, placing the stories in a wider context. Stories include at-a-glance flowcharts showing how Holmes reaches his conclusions through deductive reasoning, and character guides provide handy reference for readers and an invaluable resource for fans of the Sherlock Holmes films and TV series. • Brain Games - Sherlock Holmes Puzzles -- Are your eyes are sharp and your deductions as accurate as those of Sherlock Holmes? Solve more than 100 puzzles themed around detection and the world's most famous -- and favorite -- consulting detective! Word searches, anagrams, cryptograms, and other puzzles will test your mettle and your Sherlock Holmes knowledge. Logic puzzles, coded puzzles, and visual puzzles will let you take on the role of consulting detective and see how sharp your eyes and mind are. - This day is an opportunity to snuggle up to someone on a cold winters' day or night. Chances are it's cold outside. So, cozy up to a special someone, and enjoy the warmth and love. This day is enjoyed by both young and old. - The shortbread cookie may have been around since the twelfth century. At first, shortbread was made with yeast instead of butter, making the cookie dough more like bread dough than cookie dough. It was twice baked, and sprinkled with sugar and different spices, then left to harden. In the sixteenth century, Mary, the Queen of Scots ordered the shortbread recipe perfected. - A fictional character in the Warner Bros. Looney Tunes and Merrie Melodies series of cartoons, first introduced on January 6, 1945. A French skunk who always strolls around in Paris in the springtime, when everyone's thoughts are of love , Pepé is constantly seeking l'amour of his own. However, he has one huge turnoff to any prospective mates: his malodorous scent. - The Eve of the Feast of the Epiphany is the twelfth day of Christmas, and tonight is known as Twelfth Night (or Twelfthnight ). It begins the celebration of Christ's revealing His Divinity in three ways. - An American series of animated musical educational short films aired during the Saturday morning children's programming on the U.S. television network ABC. The topics covered included grammar, science, economics, history, mathematics, and civics. The series' original run lasted from 1973 to 1985 - did you watch back then? - Christmas is observed on January 6th in the Armenian Church, the oldest Christian national church. - The major festival of the Christian Church observed in many parts of the world with gifts, feasting, last lighting of Christmas lights and burning of Christmas greens. Twelfth and last day of the Feast of the Nativity. Commemorates the visit of the Three Wise Men (Kings or Magi) to Bethlehem. - There are more Smiths in the United States than any other surname and for this reason, it is traditional to give everyone with the name of Smith a hug on this day.